1) Lung transplantation: UNC is known both nationally and internationally for its lung transplantation program, particularly because of its pioneering treatment of patients with Cystic Fibrosis. Since he came to UNC in 1989 to run its lung transplant program, Thomas M. Egan, MD (right) has conducted research to study the hypothesis that lungs might be suitable for transplant even if retrieved at intervals after sudden death and circulatory arrest. This could greatly expand the lung donor pool, offering many more people with end-stage lung disease the opportunity to have new lungs. Dr. Egan has shown that lungs are still viable after circulation stops because lung cells obtain oxygen after death from air in the air sacs and airways (other organs require blood circulation to obtain oxygen). He was the first surgeon in the U.S. to gain FDA and UNC IRB approval to offer suitable lungs from sudden-death donors to patients for transplant. 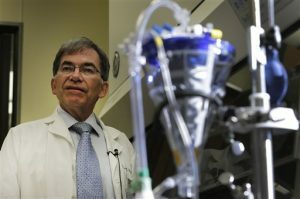 In 2013, the University of North Carolina, with Dr. Egan as principal investigator, received a $4 million, three-year grant from the National Institutes of Health (National Heart, Lung, and Blood Institute) to study assessment and transplantation of lungs from people who have died suddenly, outside the hospital, and have not been on mechanical ventilation. These are known as uncontrolled Donation after Circulatory Determination of Death (uDCDD) donors. New funding is being sought to continue the project. Dr. Egan’s lab has perfused and ventilated human lungs outside the body (ex vivo) to determine if they are suitable for transplant; the lab also has worked to show the safety of transplanting these lungs. Currently, solid organs for transplant come primarily from patients who have suffered brain death and have been on mechanical ventilation before controlled circulatory arrest. However, many lungs from these donors cannot be used for transplant because of inflammation or infection during a prolonged interval of brain death. Lungs retrieved from sudden-death victims may not only be much more plentiful; they may be superior to lungs currently being transplanted from brain-dead donors. These lungs are already used for transplantation in some European countries, based on Dr. Egan’s research. 2) Ischemia-reperfusion injury: Dr. Egan also studies lung ischemia-reperfusion injury. He founded X-In8 Biologicals Corporation, a biotech company, to develop pharmaceutical and therapeutic strategies to mitigate ischemia-reperfusion injury, based on discoveries he made. 3) Lung allocation: Dr. Egan led a UNOS subcommittee that developed a major change in U.S. allocation policy for lung transplants; the policy went into effect in 2005. The policy allocates donor lungs for transplant based primarily on estimates of survival probability on the waiting list and after transplant. The policy has been credited with saving lives and improving lung allocation. The allocation system has been adopted by Eurotransplant, Germany and the Netherlands. 4) Transcatheter aortic valve replacement:Thomas G. Caranasos, MD, right, has a special interest in aortic surgery, including transcatheter aortic valve surgery, mitral and aortic valvular surgery, and minimally invasive approaches to cardiac surgery. He is surgical director of the Transcatheter Aortic Valve Replacement (TAVR) program at UNC Hospitals and, with UNC cardiologists, has worked on ways to improve TAVR procedures, which use minimally-invasive techniques to replace aortic valves of people who are unable to undergo open-heart surgery. Watch Dr. Caranasos and Dr. John Vavalle, a UNC cardiologist, talk about their work with the TAVR procedure here, during an event at Research Triangle Park (their talk starts at 1:15:58 in the video). 5) Cardiac and lung stem cells: With Ke Cheng of North Carolina State University, Dr. Caranasos is co- investigator on a project to develop genetically engineered non-embryonic stem cells for heart regeneration. Earlier, Dr. Caranasos and Dr. Cheng worked on a study of using human lung stem cells for treating pulmonary fibrosis. *Currently, UNC has no active clinical trials for stem cell research in the treatment of pulmonary fibrosis. Please go to clinicaltrials.gov to see a listing of all clinical trials in the US to find one closest to you. 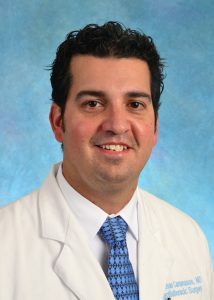 6) Aortic dissection modeling and simulation: Dr. Caranasos is an investigator with Boyce Griffith, PhD, of the UNC Department of Mathematics, on an NIH-funded study of mathematical modeling and computer simulation of aortic dissection. 7) Congenital heart disease: The UNC Children’s Heart Collaborative (CHC) is a diverse team of medical researchers who have a common interest in the diagnosis and treatment of congenital cardiac disease. Michael R. Mill, MD, nurse practitioner Karla Brown and physician assistant Ruben Bocanegra are members of the group. The collaborative facilitates research across specialties such as pediatric cardiothoracic surgery, pediatric cardiology, pediatric anesthesia, radiology, pediatric critical care, pediatric endocrinology, the UNC School of Nursing, and pediatric hematology/oncology. Members are engaged in various research endeavors directed at improving the care of children and adults with congenital heart disease. Projects in clinical and translational research, basic sciences, and outcomes research are underway. Most research teams involve students and trainees at all levels. 8) Project TICKER: Pediatric congenital heart disease patients are a high‐risk group of patients who receive care in a complex system of hospital units with a number of multidisciplinary care teams. The goal of Project TICKER, Teamwork to Improve Cardiac Kids’ End Results, is to improve the care of these patients by implementing a family‐centered safe practice infrastructure incorporating teamwork training and integrated clinical pathways (ICPs). Pediatric heart surgeon Michael R. Mill, M.D., pediatric nurse practitioner Karla Brown and other staff members who care for pediatric heart patients are involved in the project, which provides tailored teamwork training and designs and implements patient care plans, known as integrated clinical pathways, to decrease unnecessary variations in care. Multiple hospital teams, patients, and families are partners on this project, which is supported by the Agency for Healthcare Research and Quality. Read more. Surgery simulation training: Richard H. Feins, MD, was principal investigator of an eight-institution study of use of simulators to teach cardiothoracic surgery skills to resident physicians as a way to improve patient safety. The group is still analyzing and publishing results. The three-year study was funded by the Agency for Healthcare Research and Quality. The other institutions were Johns Hopkins University, Massachusetts General Hospital, Mayo Clinic, University of Rochester, Stanford University, Vanderbilt University, and the University of Washington. The grant was “Improved Patient Safety by Simulator Based Training in Cardiac Surgery” (AHRQ grant 5R18HS020451-03). Acute coronary syndrome outcomes for Medicare patients: Brett Sheridan, MD was co-principal investigator on a major study funded by NIH (National Institutes for Aging) that examined the influence of specific therapeutic strategies in elderly people who suffer from acute coronary syndrome (ACS). The multidisciplinary research team analyzed national Medicare data to discern the influence of demographics, physiology and specific (competing) treatments on outcomes of the elderly presenting with heart disease. Examination of pulmonary blood flow physiology in congenital heart disease: This project, on which Michael Mill, MD, and Brett Sheridan, MD, were co-investigators, utilized a large animal model of the Fontan procedure. A clinical arm of the study involved Cardiac Magnetic Resonance Imaging of patients who had undergone the Fontan procedure, in an effort to correlate the laboratory findings with clinical practice and further define optimal construction of the Fontan circulation. The research, funded by NIH, was performed in conjunction with the Department of Biomedical Engineering at UNC and includes researchers at Georgia Tech, Emory and the Children’s Hospital of Philadelphia. Prevent IV: Project of ex-vivo vein graft engineering via transfection of E2F decoy. This project examined the role of cell-cycle inhibition on saphenous vein graft patency used for coronary artery bypass surgery. STICH: The surgical treatment for ischemic heart disease study is an NIH-sponsored trial that randomizes patients with coronary artery disease and poor left ventricular function to receive either best medical therapy, coronary artery bypass surgery, or coronary artery bypass surgery with ventricular reconstruction. The latter group, at the time of surgery, has excision of scar tissue from previous heart attack in order to make the heart work more efficiently. UNC has been one of the leaders in recruitment and involvement with this trial. Primo-CABG II: A Multicenter, Randomized, Double-Blind trial of Pexelizumab in Patients undergoing Coronary Artery Bypass Grafting with Cardiopulmonary Bypass. This project studied the use of complement inhibition (associated with the inflammatory response) on outcomes following coronary artery bypass surgery. Reliant: Randomized evaluation of the Novacor Left Ventricular Assist System (LVAS) in a non-transplant population. This trial compared the use of two different ventricular assist devices as destination therapy for patients not eligible for heart transplant. Jarvik 2000 Multicenter Pivotal Study: This study examined the efficacy of a new generation axial flow pump for patients with decompensated heart failure as a bridge to heart transplantation. Freedom Trial: Randomized, prospective trial of operative versus percutaneous multivessel revascularization in diabetic patients.